Can My Probation Officer Search My Cell Phone? The Pennsylvania Superior Court has just decided the case of Commonwealth v. Murray, rejecting the defendant’s challenge to his conviction on corpus delicti grounds and holding that a probation officer or parole agent may search a probationer’s cell phone without a search warrant. In Murray, the defendant was charged with possession of a firearm by a prohibited person in violation of 18 Pa.C.S. § 6105. Murray’s Pennsylvania State Parole Agent became suspicious that Murray may have been involved in criminal activity after the Agent visited Murray’s group home for a home visit and Murray was not present. When Murray next reported to the parole office, the agent asked him about his living situation and why he had moved without permission. Murray explained that he had been threatened by a housemate with a gun. Murray told the agent that he wrestled the gun away from the housemate and gave it to another acquittance. Of course, parole agents went to search the group home at 1246 West Huntingdon Street and found a gun under the tub in the bathroom. The agents then called the police and gave the gun to the police. The police then charged Murray with possessing a firearm as a felon. Murray moved to exclude the statements made to the parole agent regarding the gun and also moved to suppress the results of the warrantless search of his cell phone. The trial court denied both motions. Murray was convicted of the gun charge and sentenced to 4.5 – 9 years in prison. On appeal, Murray raised two main issues. First, he argued that the Commonwealth failed to satisfy the corpus delicti rule because it failed to show that a crime had been committed prior to introducing the statements made by Murray. Second, he argued that the parole agent should have been required to get a warrant before searching his cell phone. The Superior Court rejected both arguments. First, the Superior Court rejected the corpus delicti challenge. The corpus delicti rule is a rule of evidence which prohibits the prosecution from introducing an incriminating statement against the defendant unless the prosecution can first show that a crime has occurred. The prosecution does not have to prove the crime beyond a reasonable doubt, but it must show that the evidence is more consistent with a crime than with an accident. The corpus delicti, latin for “body of the crime,” may be proven by circumstantial evidence. Here, the parole agents found a gun in a group home where Murray and numerous other parolees lived. The gun was hidden inside a plastic bag under a bathtub in the only bathroom in the boarding house. Therefore, the Court concluded that because the gun was hidden in such a way, it was more likely than not that the person to whom the gun belonged possessed it illegally. Accordingly, Murray’s statement about possessing the gun did not violate the corpus delicti rule. Second, the Superior Court rejected Murray’s challenge to the warrantless search of his cell phone. In many situations, the police may search a person’s belongings when they take that person into custody as part of an arrest. This is known as the search incident to arrest exception to the warrant requirement. For many years, this exception permitted the police to search an arrestee’s cell phone. Recently, in Riley v. California, the United States Supreme Court held that in general, police must obtain a warrant before searching a cell phone. The Superior Court, however, distinguished Riley by finding that parolee’s and probationer’s have a reduced expectation of privacy. Riley did not involve the cell phone of a suspect who was on probation or parole. Because probation officers and parole agents may conduct a search of a probationer’s house with reasonable suspicion and without having to obtain a warrant, the Superior Court held that the same rule should apply to a cell phone. Thus, a probation officer or parole agent must only have reasonable suspicion in order to search a cell phone. The Court concluded that the agent has reasonable suspicion to search the phone because Murray admitted to possessing the firearm and giving it to someone else. The agent had reasonable suspicion that the phone could contain text messages discussing the gun or photos of Murray with the gun. Therefore, the Court affirmed the trial court’s decision to deny the Motion to Suppress. If you are charged with a VUFA offense, you need an attorney who has the knowledge and expertise to fight your case. Our award-winning Philadelphia criminal defense lawyers have successfully fought countless cases at trial and on appeal. 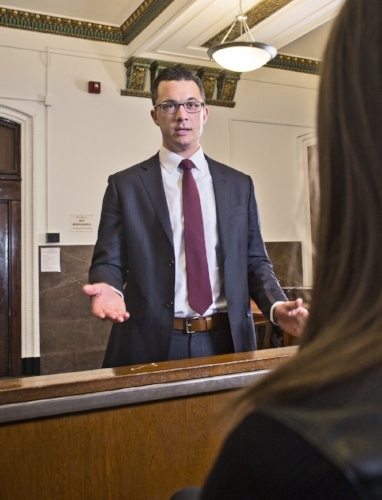 We offer a 15-minute criminal defense strategy session to any potential client. Call 267-225-2545 to discuss your case with an experienced and understanding criminal defense attorney today.